Josh Hazelwood served in the U.S. Navy from 2007-2012 and was stationed out of Norfolk, VA onboard the USS Nassau and the USS Wasp. Josh is committed to serving his country and its citizens and is now passionate about serving his clients. Josh has been featured in the Evansville Business Magazine for his invention to make flight operations in the military and at commercial airports safer. Click here to read the article, http://www.evansvilleliving.com/business/articles/ready-for-take-off, and here to watch the video, https://www.youtube.com/watch?v=Ko6mY_ld7Jw. 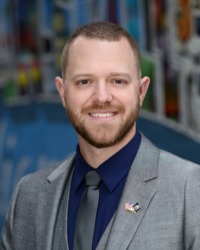 While attending USI, Josh interned at Naval Station Warfare Center – Crane as a contract specialist, managing government contracts from $5,000 to $25,000. Humanitarian medal for relief from hurricane Ike in Galveston, TX. Josh is a new agent, as of September 2018, but is highly motivated and eager to help you in your home buying/selling experience. Josh is married to his lovely wife of 11 years, Shannon. They have two daughters, Emma and Layla. Josh calls the west side of Evansville home and works out of the downtown office. Please reach out to Josh for ANY and ALL your real estate questions including buying, selling, or investing. Or just give him a call if you want to chat about the Evansville entrepreneurial community, the Indianapolis Colts, or fantasy football. He’ll be glad you reached out to him, and you will gain a friend in the real estate business.